LIFT HEAVY FITNESS prides itself on innovation, pricing and quality. This heavy-duty hand gripper exercise tool has more benefits then any other on the market. Made with super rubber, extra strength plastic parts, silent alloy spring offering a variety of exercise options. The BEST part is it's the LOWEST PRICED heavy duty hand gripper on the market as well! You can't go wrong if you're looking for a long-lasting, economic gripper to advance hand strength, grip, wrist, hands or forearms. ★ EFFECTIVE HAND EXERCISER ADJUSTABLE GRIPPER- Greatly Increases Grip Strength. Perfect for Power Lifters, Rock Climbing, Body Building, Forearm Wrist and Hand Strength applicable to Golf, Tennis and Racquetball as well as those looking to build muscles. 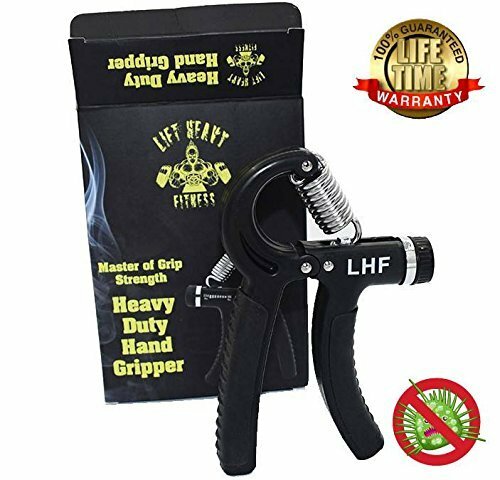 ★GRIP STRENGTH TRAINER - Proven effectiveness in rehabilitation of hands, wrists, fingers, forearms and lower arms with arthritis and carpal tunnel. It improves dexterity and helps to relieve stress. Silent spring can be used at desk, in car, while watching TV -- just about anywhere!!! ★IMPROVED MATERIAL QUALITY - Anti- Microbial and Anti-Slip Handles, stainless steel spring for adjustable high-tension resistance. ★ BEST ECONOMIC VALUE ON THE MARKET- Compared to a set of Captains Of Crush ($ 155.70) Or Mummy Fit Death Grips ($34.99) The Lift Heavy Fitness Version is ONLY $19.99 it's a huge savings and covers a higher range of weight too!!! Best gripper tool built from the strongest materials. MOST COST EFFECTIVE AND FINEST HEAVY-DUTY GRIP STRENGTH INCREASING TOOL ON THE MARKET! ★ MOST VARIETY OF POSSIBLE EXERCISES. The picture shows 6 different ways to use grippers. Also by flexing your wrist up or down, you can focus on the top or bottom of your forearms while still developing hand and wrist strength as well. VERSATILE ADJUSTABLE LIFETIME GUARANTEE SUPERIOR METAL IN STRING ANTI-MICROBIAL AND ANTI-SLIP RUBBER MAKE THIS THE BEST MODEL ON MARKET! If you have any questions about this product by Lift Heavy Fitness, contact us by completing and submitting the form below. If you are looking for a specif part number, please include it with your message.